Review of Crispin’s Original cider variety. I’ve had this cider a few times, but this is the first time since I started blogging. Actually, I’ve tried most of their varieties, from Blackberry Pear to Browns Lane to Venus Reigns. Crispin is probably my second favorite commercial cidery behind Woodchuck. Cider Description: Crisp, refreshing natural hard apple cider. Crisp over ice. A classically styled, but untraditional hard apple cider. Fruit forward, with a fresh, crunchy appley nose and a deliciously refreshing, crisp mouth feel. Where Drank: The Point in Prescott AZ. This was their only cider offering at the time. Apparently they usually had some sort of Schilling Cider on tap, but were out. I was excited to see Schilling (made in my area) all the way in AZ, so it was disappointing they were out. The Point was a very unique basement bar/lounge in Whiskey Row in downtown Prescott to say the least (it was dark and smelled lol, but overall was trying to be a higher end classy speakeasy). We were there for the whiskey selection for my husband and a friend. I was happy just to find cider that wasn’t Angry Orchard. Actually, that night I went 2/2, finding Woodchuck Amber (bottled) at Prescott Brewing Company. The following night I was 0/3 on cider, but 2/3 on mead. All in all those are above average odds on finding a beverage to my liking! First Impression: Shiny straw yellow. Almost no carbonation. Sweet kinda fake crisp apple scent. Opinion: On the drier side of semi-sweet. No bitterness. Low acidity and tartness. Tropical & pear notes. A bit juice-like. Medium bodied. Quick finish. Overall this is an enjoyable easy drinking cider which is less sweet than most commercial ciders (150 calories and 10 grams of sugar per 12oz). I liked the level of flavor, but that seems to come with the territory of being a bit sweeter (this is nowhere near dry). Its definitely “crisp & refreshing” as the bottle said, and it was quickly gone. Most Similar to: Probably Crispin Pacific Pear, as I picked up some pear notes in this cider and it is a similar level of sweetness. Or maybe Stella Cidre or Spire Mountain Apple. I haven’t found too many ciders with this level of sweetness…most craft ciders are drier, and most commercial ciders are sweeter. Closing Notes: This is a solid commercial cider selection. I especially like it isn’t overly sweet (and for folks who like an even drier cider, they make a Brut variety). However, the use of water, apple juice concentrate, and “natural apple essence” (whatever that is) disappoints me. Their description of the cider is pretty sad too… Appley? Serve over ice? No thank you. Overall though I don’t hesitate to order this cider when it is available, and I think its a much better choice than Angry Orchard Crisp Apple. If this was a craft cider, I’d probably keep some in the house. Have you tried Crispin Original? What did you think? I’m not a huge fan of Cripsin, but part of the reason was when I first started seeing it around, everyone insisted on pouring it over ice. I don’t like my cider that way. I felt like it cheapened the cider and made it more lucrative for the businesses selling it on tap. Then, the next time I went to Ireland, that trend caught on and we had to specifically ask not to have our cider over ice. Not sure if that is Crispin’s idea or if they are just following a trend, but it gave me a bad taste in my mouth about the company since it was the first time I’d seen it done. Plus, I didn’t think it was very good. It’s been several years since I’ve had it and I know they make many more varieties. So I’ll have to give them a try again. I would have to agree with Carrie. 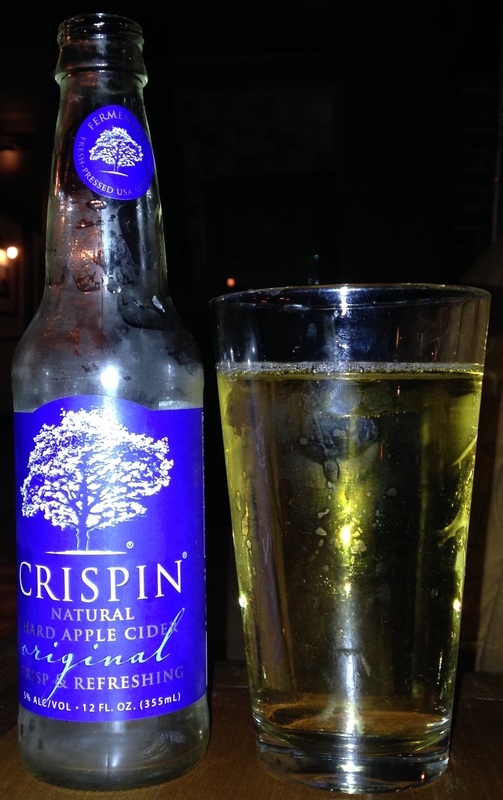 Not a huge fan of Crispin’s original flavor and normally only drink it when it is the only cider available. However, I was impressed by their Blackberry Pear flavor. The Sociable Celiac- Thanks for reading & commenting! I actually like Original better than Blackberry-Pear. But agreed, I don’t usually buy Crispin unless I’m out at a bar or whatever. Its rare for me to find anything but Angry Orchard though. Carrie-Thanks for reading & commenting. I agree about the ice thing…I recently got asked that (at a fancy restaurant when ordering craft cider even) and had a tough time not laughing. Crispin stopped that recommendation. They aren’t one of my favorites, but for commercial cider, I think they are one of the better options. I wouldn’t buy them at the store, but am happy to find them instead of Angry Orchard at a bar.